Karolin Lampert produced a brilliant front nine to surge into a one-shot lead on moving day at Westlake Golf Club, but Ashleigh Buhai is in close pursuit heading into the final round of the Investec South African Women’s Open. The German had started the second round in a tie for second on two-under and a shot behind two-time champion Buhai. On a magnificent morning tailor-made for low scoring, Lampert got off to a bogey start, but rallied with three birdies on the bounce from 13 to turn four-under. Buhai, playing behind the German, stretched her lead to five-under with birdies at 13 and 17. Lampert bogeyed the first, but birdied the par-five fourth and the 23-year-old set the clubhouse target at five-under with a birdie at the par-four eighth. She was still perched at the top of the leaderboard as action wrapped up on Friday. “I three-putted 10 and I wanted to get some shots back as quickly as possible. I had an opportunity at 12, but I missed the birdie putt from about eight feet. I stayed patient and hit some good shots into 13, 14 and 15 and the putts finally started rolling in. Buhai birdied four to go six-under, but hit a major wobble when she dropped three shots in succession from the sixth. “I played really steady on the front nine and hit some really good shots, but I got myself in to a bit of a downward spiral on my back nine with three soft drops,” said the 28-year-old. “I saw the lead was five-under coming up the eighth and I really wanted to make that last birdie. She hit her approach to 25 feet and nailed the putt for a 71 to finish within a shot of Lampert. “The ninth hole was playing a lot shorter, so I hit driver and a wedge into the green. I have to admit that I have some mixed emotions. I’m happy that I got it to six under and I’m disappointed that I let it slip. Coming up the last, I just wanted to make sure I am still in the mix after the wobble and I did it with that birdie. Former Sanlam SA Amateur champion Bonita Bredenhann also got it to five under with three birdies in the first four holes, but she turned level par after a trio of bogeys. The big-hitting Namibian erased a fourth bogey at 10 with a birdie at 13, and holed a 25-footer at 18 for birdie. A round of 71 earned her sole third place on three-under. The Ladies European Tour’s top ranked player Valdis Jonsdottir was two-under coming down 18, but the Icelander had tree trouble and bogeyed the closing hole. The LET number 10 signed for 69 and will start the final round tied for fourth on one-under with Morocco’s Maha Haddioui, who shot 71. Defending champion Lee-Anne Pace opened with a 78, but trended towards the leaders with birdies at four, seven, 13 and 17. Her par-putt at 18 just shaved the hole and a 69 puts her at three-over. “To tell you the truth, I was worried that I’d miss the cut,” laughed Pace. “It was a little embarrassing turning up here this morning, but I got the putter going really nicely today. And for Lindi Coetzee the final round is bound to be really special. Fresh off her first provincial victory in the North West Open, the Gauteng North golfer was the only amateur to make the cut to 50 and ties with rounds of 77 and 73. Irrespective of what Coetzee shoots in the final round, she will stand next to the champion to receive the Jackie Mercer Trophy as the leading amateur in this year’s Investec South African Women’s Open. 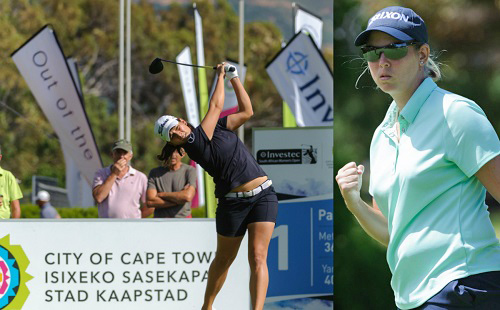 Written by and released by Lali Stander on behalf of the Sunshine Ladies Tour and WPGA.